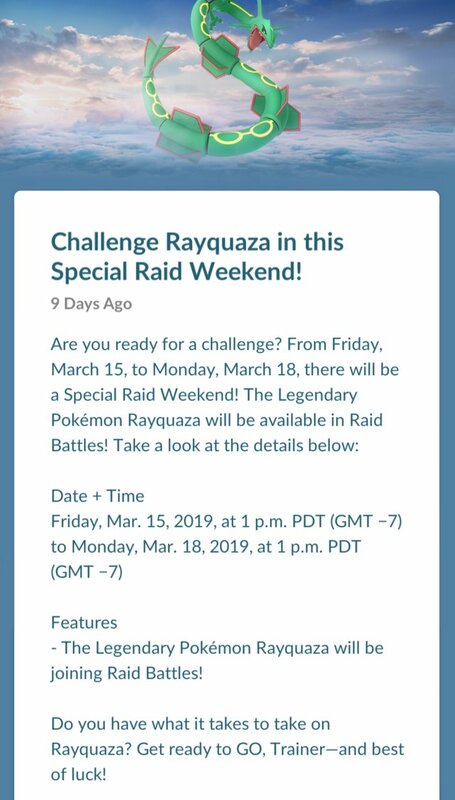 Starting today, the legendary Pokémon Rayquaza will be appearing once again in raid battles. While not much details will be provided, many players have been thinking about these dragon type Pokémons as they are currently good counters to the other legendary bosses that are now available. Rayquaza is a Generation Three Legendary Pokemon that looks pretty cool! in the past, the company Niantic would also release some unique features for Pokémon during the special weekend rates. However, none have been announced for this weekend. They typically never announce shiny forms which would be something I would expect at the least to come out of the special weekend event. However, no special moves or features. Rayquaza is a dragon type Pokémon that also has flying and rock abilities. The best counters to use so that you can prepare for the weekend are ice and dragon type Pokémons as well. The most used are Articuno, Dragonite, and Lapras although others within the game can be used as well. The shiny form looks pretty good so let’s hope it is released despite not being mentioned.